A pair of albums from the great Dennis Brown – issued here along with 20 bonus tracks too! First up is Just Dennis – a hell of a debut from Dennis Brown – his first album as "just Dennis", and a soulful classic that really stands out from the pack! Just the first few notes of the record will remind you that Brown was easily one of the most impressive singers of his generation – a powerfully charismatic talent who brought a whole new level of soul to reggae, and one who could also write some great material as well! Niney The Observer produced the set to perfection – with a crisp crackle that really suits Dennis well – and titles include the hits "Westbound Train", "No More Will I Roam", "Cassandra", and "Conqueror" – plus "Run Too Tuff", "Africa", "Yagga, Yagga (You'll Suffer)", and "Show Us The Way". Next is Deep Down – a great little record – the follow-up to Dennis Brown's debut on Trojan, but a record that hardly ever saw much circulation back in the day! 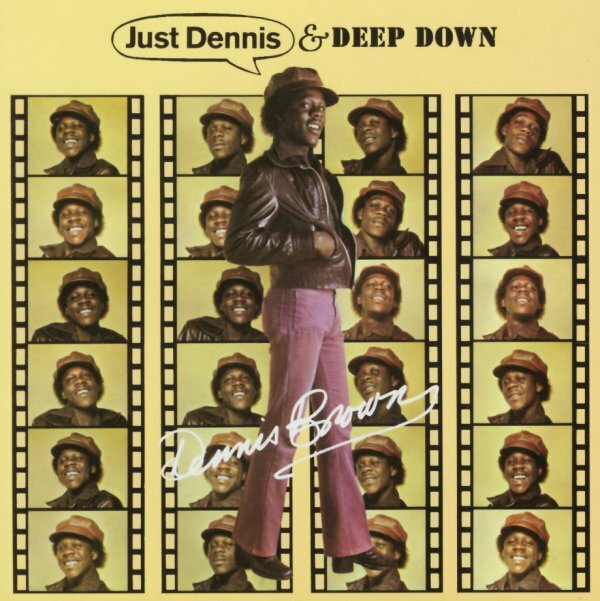 The production is handled by Niney The Observer, and has this righteous quality that really matches Dennis' message in his music – slow-stepping, head-nodding, and always with the kind of measured patience to see things through to the end – a complete delight when topped with Brown's fantastic vocals. Titles include "So Long", "Voice Of My Father", "Tribulation", "Shame", "Say Mama Say", "God Bless My Soul", and "Open The Gate". Bonus tracks include some collaborations with Big Youth, I Roy, Dillinger, and others – and titles include "Blood Son", "Wolf & Leopard (ext)", "Take A Trip To Zion", "Here I Come", "Flat Foot Hustling", "Jah Come Here", "My Time", "Six Dead & Nineteen Go To Jail", "Give A Helping Hand", "Why Must I", "Rock With Me", and "Africa (ext)". © 1996-2019, Dusty Groove, Inc.